AleaSoft, December 3, 2018. 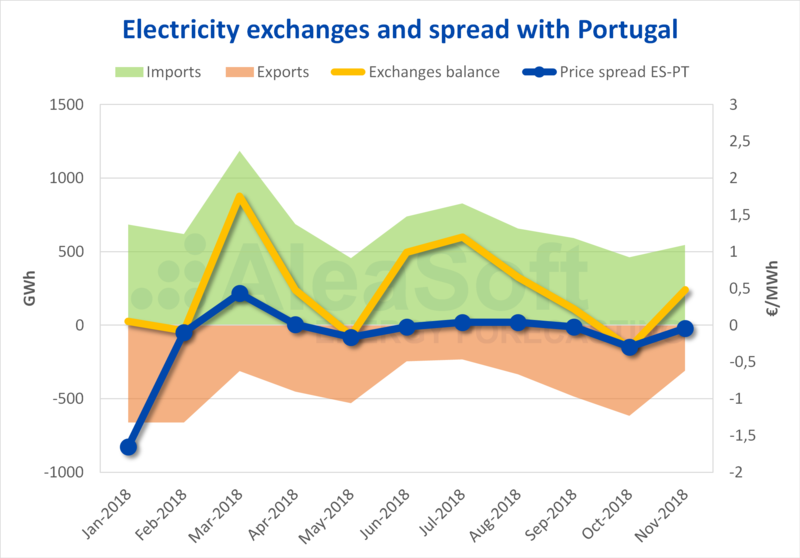 In this second release of the AleaSoft summaries on the main factors that have influenced the price of the Iberian electricity market this year 2018, the influence of the rest of European markets through interconnections is analysed. On November 27, we analysed the influence of external factors, such as the price of fossil fuels and the CO2 emission rights, on the price of the Spanish electricity market during this year 2018. On this occasion, we analyse the influence that the interconnections of Spain with other European markets has had in the price of electricity. The Spanish electricity system is interconnected with the electricity system of Portugal, forming both the Iberian electricity system, and with the electricity system of France, and by this route, with the Central European electricity system. In turn, the Central European electricity system is connected with the Nordic countries, with the Eastern Europe countries and with the British Isles. Spain is also connected with North Africa through Morocco. The interconnection between the European countries is essential to achieve the implementation of the European Internal Energy Market whose objective is the supply of electricity and gas to European consumers in a safe way, sustainable with the environment and at the lowest possible price. The Iberian Peninsula, precisely because of its geographical location, has difficulties interconnecting with the rest of Europe, which is why it is considered an “electric island”. Currently the interconnection capacity with France is 2,800 MW, so the interconnection ratio of Spain, which is below 5%, is far from the European objectives: minimum interconnection ratio of 10% for 2020 and 15% for 2030. The interconnection ratio represents the interconnection capacity with respect to the total installed power capacity. The underwater electrical interconnection project through the Gulf of Bizkaia is currently under consultation; this project will increase the electricity exchange capacity between Spain and France to 5,000 MW. Its commissioning is scheduled for 2024-2025. This project has been declared of European interest. Nevertheless, Spain will continue to be below the objectives set by the European Union. One of the objectives of the interconnections is to increase the efficiency of the interconnected systems. In the daily market, as long as available interconnection capacity allows it, energy flows from the country where it is cheaper to where it is more expensive. If the interconnection capacity is sufficient, the price will be the same for the two interconnected markets, if the capacity of the interconnection is not sufficient, the price in the interconnected markets will be different. In the ideal case in which the interconnection capacity between European countries would be infinite, the price of all the interconnected markets would be the same for each hour. This is the basic idea behind the European Single Market. In 2018, until December 4, there has been Market Coupling between Spain and Portugal, that is, the price of Spain and Portugal has been identical, the 94.61% of the hours. The average price of Portugal to date, of 57.09 €/MWh, has been slightly higher than that of Spain, of 56.93 €/MWh. In most of the months of 2018, Spain has been a net importer from Portugal. Sources: Prepared by AleaSoft with data from OMIE and E.SIOS. However, in the case of the interconnection with France, in which the interconnection capacity is lower, Market Coupling has been achieved only 24.68% of the hours. In most of the months of 2018, Spain has been a net importer from France coinciding with the months when the price of France was lower than that of Spain. 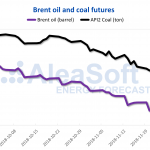 Sources: Prepared by AleaSoft with data from OMIE, E.SIOS and EPEX SPOT. 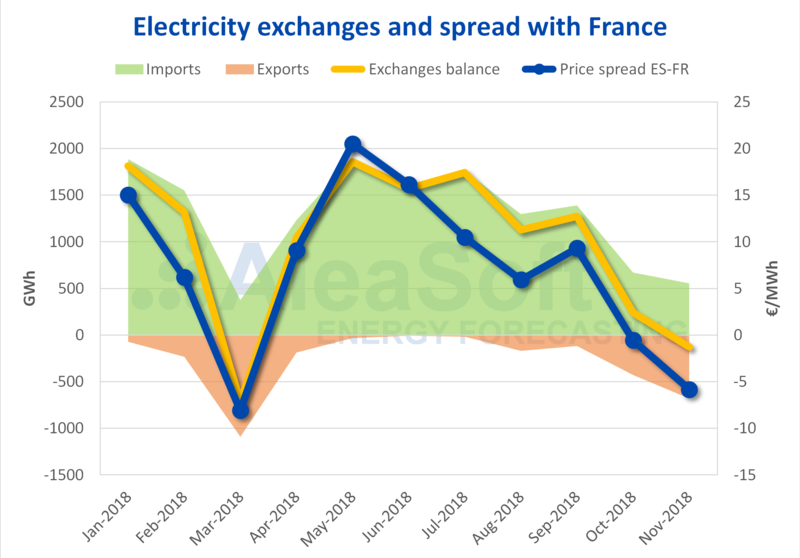 The average price of France in 2018 until December 4, of 49.81 €/MWh, has been lower than that of Spain. In this way, having been a net importer of electricity from France, Spain has achieved a lower price than if there were no interconnection. After the publication of the Royal Decree-Law 15/2018, of October 5, with measures to lower the electricity bill, more Spanish gas combined cycles have come to produce in the electricity market, displacing agents that generate electricity from our neighbouring countries. 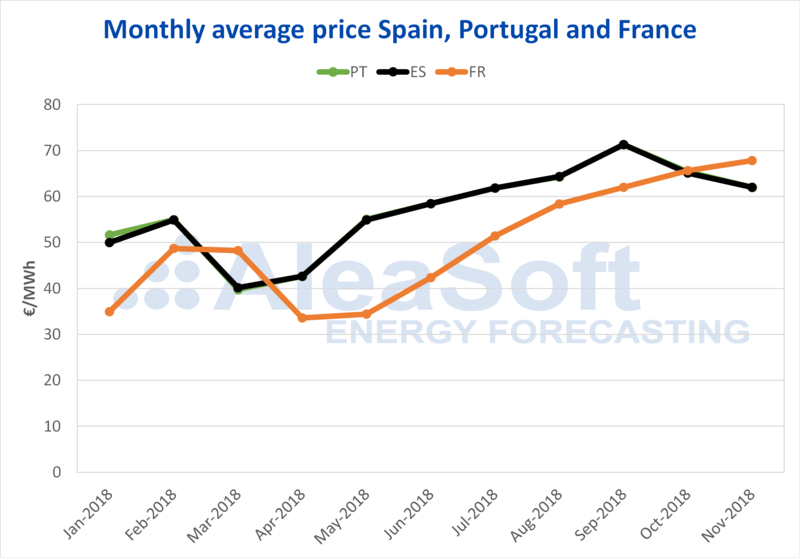 In 2019, France electricity futures in the EEX market are trading lower than the electricity futures of Spain in the OMIP market, so in AleaSoft it is estimated that next year Spain will again be a net importer of electricity from France. 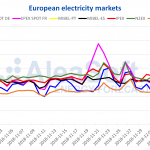 AleaSoft considers that the reinforcement of interconnections is fundamental for the development of the European electricity market with more homogeneous and more stable prices. Better interconnections will allow a greater integration of renewable energies with the consequent elimination of other pollution sources and non-renewable electricity production.